The mission of our Writing Center is to connect writers with readers. This helps to make good writers better writers. It also encourages writers to develop an awareness about themselves that will help them after they leave the Writing Center. 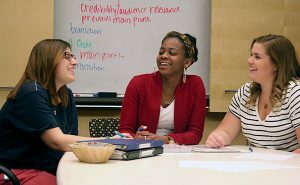 The University Speaking Center provides consultation support and instructional workshop services for UNCG students, faculty, employees, and members of the Greensboro community. Our support is designed to help speakers further develop their own oral communication confidence and competence. We provide peer-to-peer feedback, guidance, instruction, and other support in the areas of public speaking preparation and delivery, interpersonal communication, and group or team communication. We do not operate from a one size fits all philosophy, we never have. 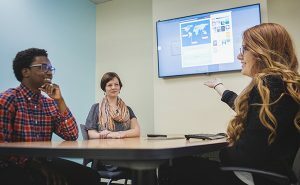 The Digital ACT (Action, Consultation, and Training) Studio supports students, faculty, and staff in their effective creation or incorporation of digital media into projects. Consultants act as a trained, engaged audience, providing feedback on slide presentations, video projects, podcasts, digital photography, websites, and blogs by offering collaborative, dialogue-based consultations.